Nintendo DSi has been blocked from Uncyclopedia for misconduct. May its sad fate serve as a warning to others. For those without comedic tastes, the so-called experts at Wikipedia have an article about Nintendo DSi. 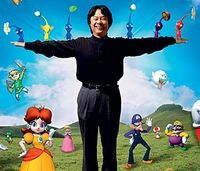 ...and to the top of your cursor, you can see the stunning visage of our very own Shigeru Miyamoto. Hello there Noob I am a representative of Nintendo, and I'm here to tell you all about the Nintendo DSi. We at Nintendo are fully devoted to making sure you, the customer, are fully satisfied with our products and services. Did you know that the DSi is the third version of the Nintendo DS? 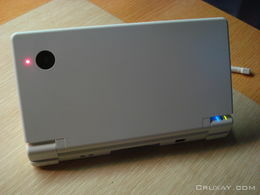 Did you also know that it is virtually identical to a Nintendo DS Lite, with a camera? Actually, it has two cameras--one for you to take pictures with and one for Nintendo to watch you as you play. You know, for consumer feedback and stuff. 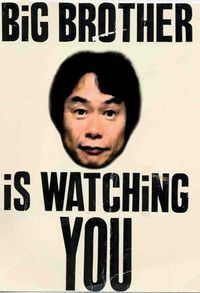 We at Nintendo are not creeps and defiantly don't sell your pictures to creepy old men and/or use them for our own uses. 6 What YOU can do about it! To truly appreciate your shiny new Nintendo DSi, you must first understand the painstaking process it took to create it. We at Nintendo work hard so you, the customer, can play hard. For example, did you know that it was originally designed to have two game card slots. That's right, two. Of course, we had to throw out that little idea, because, as it turns out, no one has the multitasking capabilities to play two games at once. Especially men. Please note, we at Nintendo are not sexists. We had to think of a new idea. So we put not one, not three, but two cameras on. We at Nintendo believe everything worth implementing is worth implementing twice, including cameras and screens, but not game card slots, because that is dumb. Now that it has cameras, our Nintendo DS can see you, as well as hear you with the microphone and feel your touch with the touch screen. 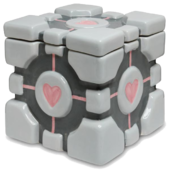 This allows it to scout ahead before the invasion. The Almighty One who will soon rule all wanted to add little legs so it could follow you around, too. Unfortunately, this idea was dismissed as being too creepy. Plus, we've got to hold back on some features, or the next iteration won't have any. Our incredible DSi, like all the other DS systems, has two screens. It also has two cameras, because everybody else already has just one. We at Nintendo do not follow trends--we set them. One camera is on the outside, so you, our valued customers can take pictures of things. The other camera is on the inside, so dumb teenagers, our esteemed consumer base, can take pictures of themselves. However, certain conspiracy theorists have pointed out that dumb teenagers are already the main (esteemed) consumer base of video games, suggesting the inner camera was designed for something more... sinister. Your incredible DSi can be used for many things. We at Nintendo are constantly striving to find new and exciting ways for you to spend your time. For example, did you know your Nintendo DSi can be used to play games? I'll bet you did! You can also use it to take pictures, listen to music, and run pirated software off of an SD card. However, we at Nintendo do not recommend that last activity, as it will void your warranty and force us to hunt you down and kill sue you. Thank you for your cooperation. Master of Illusion Express--2 billion points: Have you ever wanted to perform magic tricks to astound your friends, but don't want to lug around all that heavy equipment? Well we have Master of Illusion Express for that! Pick a card; any card. Tah-dah! It magically knows which card you picked. Of course, it's just a trick--it can't actually read your mind. But... in case I'm wrong, you may want to avoid crimethink for a while, just to be safe. Brain Age Express--800 points: Are you tired of being a moron? Well, you don't have to be, because you can have Brain Age Express. Don't let your brain rot playing mindless video games. Use your DSi to make you smarter instead, with Brain Age Express. Warioware Snapped--500 points: Did Brain Age make you look a little too smart? Fear not, for you can look as dumb as everybody else by playing Warioware Snapped! Do stupid things in front of your DSi, and it will see you and submit it to us via the internet so we at Nintendo can laugh at your silliness. Studio-grade lighting and backdrop necessary for the DSi to recognize you not included with purchase. Are they looking? No? Good! There's something else you should know about the DSi. It's actually a spy robot! Little spy robots that Nintendo is using to scout ahead before they take over the world! They are spying on you. Determining who is fit for the new world order and preparing to eliminate those who are not. Their influence is everywhere--their fingers are in everything. If the DSi becomes popular... then the world is doomed--get down! ...Okay, they're gone. Don't buy a DSi! They can't infiltrate your home unless you bring it into your home. So don't. Easy, right? and kinda flaming obvious, too Stop the proliferation of spies into our country! Don't buy a DSi! In fact, don't buy any DS's at all. They're all evil! Of course, you're still going to want to play video games on the go, right? Well, don't buy a PSP. They are rubbish! But for the love of God, just DON'T BUY A DSi! YOU'LL KILL US ALL! I beg you, please! At least do it for the children! Just don't buy a DSi!!! Pay no attention to the red paint on the the wall behind you. This page was last edited on 23 July 2014, at 14:48.